We have been on a journey that began with personal reflection and then expanded to thinking about the way we work with others and develop teams and communities. 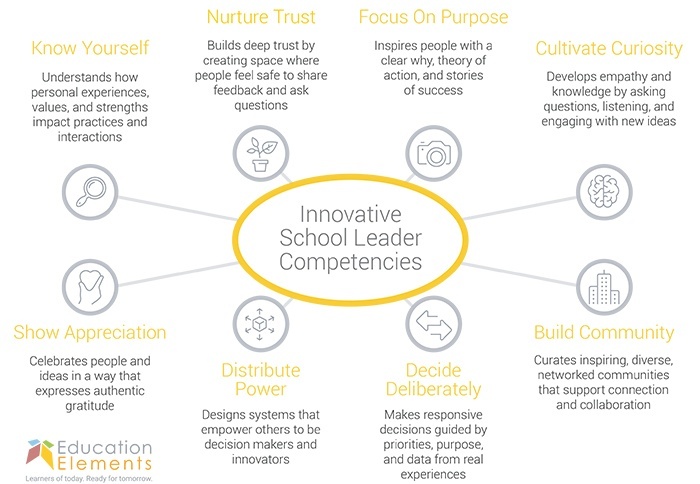 In the final installment of our three-part leadership series, we will discuss how to use the Innovative School Leader Competencies to take the reins and drive innovation. FOCUS ON PURPOSE: Inspires people with a clear why, theory of action and stories of success. WHY? If you have ever been a part of an ambiguous committee with little direction or decision making power, you see the value of having a clearly articulated purpose. Strong innovative leaders have done the work of understanding themselves and allowing others to do the same and as such have a comprehensive understanding of the values and priorities of their school. Working groups, committees, and individuals understand the overarching purpose at their school and can trace their individual contributions to this theory of action. In short: a purpose gives you a reason to do what you do on any given day; it also gives you a way to talk about your work and make decisions. HOW? Mackenzie Fogelson from The Ready talks about how leaders often concern themselves with creating the perfectly worded vision but most team members care less about the wording and more about connecting the “how” to the “why.” When a purpose is clear, all employees are able to make decisions aligned by a purpose. The magic also lies in the clear connection between the organization’s purpose and the purpose of individual contributors. Our experience working with innovative leaders has highlighted that strong collaboration can occur when a clear purpose is laid out in a common language everyone can access and use. Much like my family game nights, things go better when we are all playing the same game, using consistent rules and strategies. Team Charter: Form as a team around the values you hold dear and how you anticipate working together to reach your goals. Cover Story Vision Canvas: Once you have determined how you plan to work as a team, consider what story you want others to tell about your school by developing a “cover story” in the publication format of your choosing. DECIDE DELIBERATELY: Makes responsive decisions guided by priorities, purpose and data from real experiences. WHY? After an unlucky commute, I found myself with a shattered phone. After speaking to the carrier representative, I was paralyzed. Should I get a new phone? Should I wait until a new phone comes out or go with a less expensive, outdated choice? What could my budget handle? What color? I gave the salesperson my best smile and subsequently opted to do nothing for a long time. I was pleased to discover that what I experienced has a name: Decision Fatigue. What I had seen on a small scale with my phone is similar to what leaders face making many decisions every day. As we increase the number of decisions made, we decrease the quality of each of those decisions. According to a study by Jonathan Levav of Stanford and Shai Danziger of Ben-Gurion University, judges who preside over cases in the afternoon when their decision-making reserves are depleted are less likely to grant parole to inmates with the same charges as their morning counterparts. If we know that our decision-making abilities are limited in number each day, it is incumbent on school leaders to prioritize certain decisions and distribute decision-making power to other willing and capable individuals. HOW? In striving to make better decisions, much like committing to a healthier diet, it is important that we do not rely on willpower alone. Incorporate some of the following strategies to ensure that you set yourself up to prioritize decisions and decision distribution. Codify a personal decision-making process in order to approach decisions with a predictable structure (ex: BICEPS, MSCW, Making Wavelengths). Create systems for decision-making to ensure consistency for everyone. Consider adopting the New School Rules’ approach to decision-making. Think through a few possible outcomes: We might limit ourselves if we consider one factor alone in decision-making. Try a few strategies to consider all of the potential outcomes of your decisions using the ideas from How to Make a Big Decision. DISTRIBUTE POWER: Designs systems that empower others to be decisions makers and innovators. WHY? After learning about the importance of strong and robust teams, it would seem obvious that we need to release responsibility. Still, when we are placed in leadership positions, many of us often struggle to release control of tasks, teams, and decisions. This is often rooted in fear of failure and our reluctance to acknowledge power. I have observed my own struggles with this dynamic. In my role, I am tasked with building the capacity of teams in our partner districts as we introduce new structures. When I kick off a project, I have a general overview of the goals. I also know that there are variables I have yet to discover. Our CEO, Anthony, refers to them as “known unknowns” (information we know is coming but we don’t have yet, like number of participants in a workshop) and “unknown unknowns,” (items that we cannot anticipate – hello, snow day in upstate New York!). As I start uncovering these mystery variables, my knee-jerk reaction is to hold knowledge and tasks close to me until I can present them as palatable nuggets of information. While the intention to protect others is good, the outcome is that those who depend on me are operating without all of the information needed to do their best work. I must release control. Additionally, after releasing control of information and tasks, we must stand back and allow others to stumble, learn, and thrive. One superintendent who I worked with recently stands out to me as someone who distributes power well. After a meeting, I approached him to check in because I noticed he was very quiet during our conversation. His reply to me was, “I prefer to sit back and stay quiet. I know the minute I speak the dynamic of the conversation changes. I trust my team and I want them to come to their own conclusions, even if I do have thoughts or opinions.” This doesn’t mean he opts out of difficult conversations, in fact, he saves his strongest opinions for when he has a significant concern and wants to redirect his team. Still, he recognizes the power in his title and how a simple opinion could be interpreted as a directive or decision. Much like Vicki Abeles encourages in Beyond Measure, as referenced at the beginning of this post, we as leaders must let our teams come together as a great choir. Refine your communication skills to ensure your team has the information they need: The CEO’s most important operational responsibility. Create a “liberated” team: Give Your Team the Freedom to Do the Work They Think Matters Most. Get practical and create a system for delegating authority: Delegate decisions using decision matrix. Trying out an idea from this post? Let us know how it goes by tweeting us @edelements with the hashtag #LeadToInnovate. District Leaders are leaders at the district or multi-school level who support initiatives related to principals and teachers. School Leaders are administrators such as principals, assistant principals or deans who lead campus-wide initiatives. Coaches are individuals who support teachers to improve instructional practice. Whether or not an individual’s title includes the word “coach,” any person who provides feedback, professional development, and coaching can play a significant role in supporting teacher innovation. Teacher-Leader: Teacher-leaders not only lead student-centered environments, but have an influence on others beyond their classroom. Teacher-leaders play a key role in motivating and developing their peers as they embrace innovative practices. Stay tuned for the next post in the Innovative Leadership Series about innovative coaches! If you haven't already, read Part 1: How to Become an Innovative School Leader and Part 2: Involving Others to Create a Culture of Innovation. Invest in your development as a leader and join us at the Personalized Learning Summit 2019 to meet and collaborate with other innovative leaders from across the country, share perspectives and ideas, and learn from a range of workshops and tours of innovative companies. Andrea Goetchius is a Senior Design Principal on the Design and Implementation Team working with schools and districts to best meet the needs of all learners. 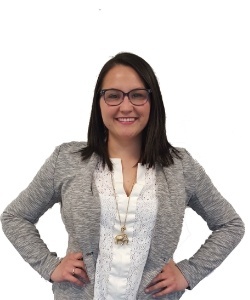 Andrea enjoys collaborating with and connecting clients across the country to leverage a community of innovation as schools embark on a personalized learning path. Andrea began her career as a Special Education Teacher in Glendale, Arizona. During her time in the classroom, she coached and supported student teachers and led staff development. Andrea then worked for Teach For America as a Manager of Teacher Leadership Development where she coached and supported teachers to match their strengths and skills with the needs of their students. She has coached in pre-school to twelfth-grade classrooms with a focus on implementing Culturally Responsive Pedagogy in the classroom. In her current role, Andrea specializes in projects that bring personalized learning to scale across districts, regional centers, and state entities. She is passionate about the development of innovative leaders.